Monthly Recap | April '15. Happy birthday to me! Blog tour: Interview with Rosamund Hodge – Crimson bound. Hello guys, I was lucky enough to be accepted for the blog tour for Crimson bound, hosted by The Midnight Garden. Crimson Bound is the new stand-alone book by Rosamund Hodge, the author from Cruel Beauty. I read Cruel beauty last year and it instantly became one of my favorite books. I am currently reading Crimson Bound and it’s just as good. Keep an eye out for my review! Crimson Bound will be available in stores and online on May 5, 2015 in hardback, as well as on audiobook. Add it to your GoodReads shelf here! Inspired by the classic fairy tale Little Red Riding Hood, Crimson Bound is an exhilarating tale of darkness, love, and redemption. Check out the other stops too, because there are a lot of interesting posts! I am happy to share this interview with you today. I loved Rosamund’s answers and I hope you love them too. Review 224. Maria Headley - Magonia. Published: April 28th 2015 by HarperCollins. Aza Ray is drowning in thin air. Since she was a baby, Aza has suffered from a mysterious lung disease that makes it ever harder for her to breathe, to speak—to live. So when Aza catches a glimpse of a ship in the sky, her family chalks it up to a cruel side effect of her medication. But Aza doesn’t think this is a hallucination. She can hear someone on the ship calling her name. Only her best friend, Jason, listens. Jason, who’s always been there. Jason, for whom she might have more-than-friendly feelings. But before Aza can consider that thrilling idea, something goes terribly wrong. Aza is lost to our world—and found, by another. Magonia. Above the clouds, in a land of trading ships, Aza is not the weak and dying thing she was. In Magonia, she can breathe for the first time. Better, she has immense power—and as she navigates her new life, she discovers that war is coming. Magonia and Earth are on the cusp of a reckoning. And in Aza’s hands lies the fate of the whole of humanity—including the boy who loves her. Where do her loyalties lie? Wow. This book is a delicious combination of weird, unique and utter strangeness. I gave it 4 stars, because the writing-style didn’t work for me. There was something about it that didn’t click with me, but towards the middle of the story I warmed up for it and the interesting promise kept me engaged. There was a moment in the beginning where I thought about quitting, but I’m happy I pushed through it. 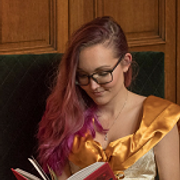 Fairytale News | Feedback and co-blogging. I talked about originality a while back; how hard it is to come up with refreshing content and how I was worried people might get bored by my content. I also asked you how you come up with new ideas or how you write your discussion posts. Your feedback was very helpful and someone said it might be a good idea to respond to everything you said with a new blog post. Here it is! I think you all agreed on one thing: originality is hard and almost impossible. Sure, sometimes you come across something that hasn’t been used that often, but something entirely new is hard to come by. You also thought it’s fine to take a popular topic as long as you stay close to yourself and your own voice. Your opinion will always be different from someone else since you are an unique person. You always add something to the topic. It’s strange how I always tell other people this, but when it comes to myself I had to hear it from someone else too. That being said, I think it’s time for me to let go of being worried about my content. Some of you said that, as long as you are proud of what you post, it doesn’t really matter what other people think. There has never been a moment where I didn’t feel confident about my posts. I’m happy with my own content, but at the same time I also want to make sure my followers like it. Your feedback and the compliments definitely worked, thanks for all the positivity! I sometimes see bloggers with surveys and since that’s not something I want to do, it was great to get some feedback this way. Have you ever made a feedback survey and how helpful was it for you? I also saw a couple of people mention they were thinking about finding a co-blogger. I think that’s a great idea for some. I follow a couple of blogs with co-bloggers and they sound like the best teams ever, but for now it’s not something I aspire. I think two (or more) people can come up with great ideas together, but to be honest, this blog is mine. It represents everything I am and I don’t think I could share this place with someone else. I’m also a bit of a control freak, so it would be too hard to let go of certain things. How do you feel about co-blogging, would it be something for you? Review 223. Anne Blankman – Conspiracy of blood and smoke. Title: Conspiracy of blood and smoke. Published: April 21st 2015 by Balzer + Bray. Sort: Prisoner of night and fog #1. Part 1. Prisoner of night and fog. The girl known as Gretchen Whitestone has a secret: She used to be part of Adolf Hitler’s inner circle. More than a year after she made an enemy of her old family friend and fled Munich, she lives with a kindly English family, posing as an ordinary German immigrant, and is preparing to graduate from high school. Her love, Daniel Cohen, is a reporter in town. For the first time in her life, Gretchen is content. But then, Daniel gets a telegram that sends him back to Germany, and Gretchen’s world turns upside-down. And when she receives word that Daniel is wanted for murder, she has to face the danger she thought she’d escaped-and return to her homeland. Gretchen must do everything she can to avoid capture and recognition, even though saving Daniel will mean consorting with her former friends, the Nazi elite. And as they work to clear Daniel’s name, Gretchen and Daniel discover a deadly conspiracy stretching from the slums of Berlin to the Reichstag itself. Can they dig up the explosive truth and get out in time-or will Hitler discover them first? I fell in love with Prisoner of night and fog. Anne wrote such an engaging story and she managed to do the same with Conspiracy of blood and smoke. Her research resulted in an interesting story about the rise of Hitler. Most historical books take place in World War II, so I love the setting where we see how Hitler takes over with his charisma and sneaky manipulation. Review 222. Liesl Shurtliff – Jack: the true story. Title: Jack: the true story of Jack and the beanstalk. Published: April 14th 2015 by Knopf Books for Young Readers. All work and no play makes Jack extremely bored. And when Jack gets bored, he makes mischief. It’s not that he’s bad; he just longs for adventure—and there’s nothing adventurous about toiling day and night to grow yucky green stuff. Adventure finally arrives one day in the form of giants, and soon Jack is chasing them to a land beyond the clouds, with his little sister, Annabella, in tow. The kingdom of giants is full of slugs the size of sheep, venomous pixies as tall as grown men, and a chatty cook with the biggest mouth Jack has ever seen. There’s giant fun to be had, too: puddings to swim in, spoons to use as catapults, monster toads to carry off pesky little sisters. But Jack and Annabella are on a mission. The king of the giants has taken something that belongs to them, and they’ll do anything—even dive into a smelly tureen of green bean soup—to get it back. Last year I read Rump and I enjoyed it, so when I saw this book on Netgalley I knew I had to request it. I thought this book was even better, because there was more action and adventure. Jack is, like his mother always calls him, a ‘naughty little boy’ and I thought it was a perfect portrayal of a young boy. Add pixies, elves, giants, magic, mystery and a quest for his lost father and you’ve found yourself an engaging Middle Grade story. I’m not saying I am an expert when it comes to blogging, but this year I celebrated my 3rd blogoversary (and I completely forgot about it) and I think I have some experience when it comes to blogging. I did something similar when I celebrated my 2nd blogoversary. You can find those tips here, where I talked about my blogging methods. Some of my tips might come in handy – but it’s fine if you do it your own way of course! Let’s start right away with the most important advice I can give you: do what feels good to you. There is no right or wrong way when it comes to blogging (except for the most obvious things as: don’t steal someone’s content). The tips I’m going to give you are only meant as guidelines. In no way you should let anyone else dictate what you do with your blog and content. -Goodreads. I would recommend to cross-link your reviews with Goodreads. This is the website that inspired a lot of people to start their website and this platform might give you new blog followers. I’m still not sure if it’s best to post your whole review or only a teaser. What do you recommend/use? I just copy-paste my entire review there with a link to my blog-review. Review 221. Victoria Schwab – A darker shade of magic. Title: A darker shade of magic. Published: February 27th 2015 by Titan Books. Sort: A darker shade of magic #1. Kell is one of the last Travelers—rare magicians who choose a parallel universe to visit. Grey London is dirty, boring, lacks magic, ruled by mad King George. Red London is where life and magic are revered, and the Maresh Dynasty presides over a flourishing empire. White London is ruled by whoever has murdered their way to the throne. People fight to control magic, and the magic fights back, draining the city to its very bones. Once there was Black London - but no one speaks of that now. Officially, Kell is the Red Traveler, personal ambassador and adopted Prince of Red London, carrying the monthly correspondences between royals of each London. Unofficially, Kell smuggles for those willing to pay for even a glimpse of a world they’ll never see. This dangerous hobby sets him up for accidental treason. Fleeing into Grey London, Kell runs afoul of Delilah Bard, a cut-purse with lofty aspirations. She robs him, saves him from a dangerous enemy, then forces him to another world for her 'proper adventure'. But perilous magic is afoot, and treachery lurks at every turn. To save all of the worlds, Kell and Lila will first need to stay alive — trickier than they hoped. April retelling link-up | Giveaway! Don't forget to tweet with the hash tag #fairytaleRC so I can keep up with your tweets! It is almost my birthday (April 17th) and today I have something awesome to offer you. In my three years of blogging I have never hosted a giveaway before, but today I'm going to change that! I still need to pinch myself, because I find it hard to believe that I can offer you this wonderful prize. And no, it is not an April fool's joke. Last month I was approached by Sam Edes from Pan Macmillan. 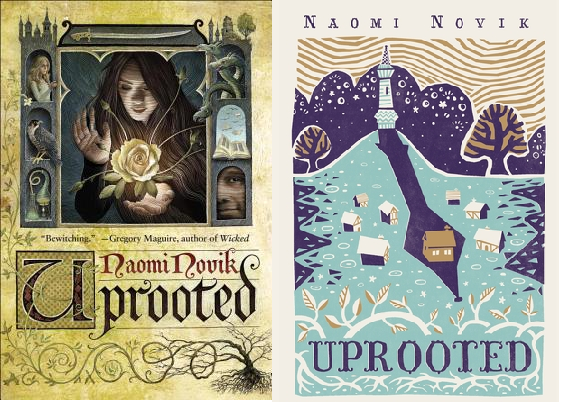 Author Naomi Novik suggested they had to get in touch with me about her upcoming book Uprooted. This book is described as "a bold, new world rooted in folk stories and legends, as elemental as a Grimm fairy tale" and it's mainly a Beauty and the beast retelling. It will be published May 19th and it sounds like a perfect book for me and my blog. “Our Dragon doesn’t eat the girls he takes, no matter what stories they tell outside our valley. We hear them sometimes, from travelers passing through. They talk as though we were doing human sacrifice, and he were a real dragon. Of course that’s not true: he may be a wizard and immortal, but he’s still a man, and our fathers would band together and kill him if he wanted to eat one of us every ten years. He protects us against the Wood, and we’re grateful, but not that grateful.” Agnieszka loves her valley home, her quiet village, the forests and the bright shining river. But the corrupted Wood stands on the border, full of malevolent power, and its shadow lies over her life.Her people rely on the cold, driven wizard known only as the Dragon to keep its powers at bay. But he demands a terrible price for his help: one young woman handed over to serve him for ten years, a fate almost as terrible as falling to the Wood. The next choosing is fast approaching, and Agnieszka is afraid. She knows— everyone knows—that the Dragon will take Kasia: beautiful, graceful, brave Kasia, all the things Agnieszka isn’t, and her dearest friend in the world. And there is no way to save her. But Agnieszka fears the wrong things. For when the Dragon comes, it is not Kasia he will choose. I am happy to announce that I can offer you 50 (YES, FIFTY) ARC's provided by the publisher Pan Macmillan. It's only available for European countries (please make sure you are eligible for the giveaway) and you must be aged 18 and older, or 13 and older with parental permission. Your details will be send to the publisher who will make sure you get your price. All you have to do is enter the Rafflecopter. Cheating is of no use, save yourself (and mostly me) the time.